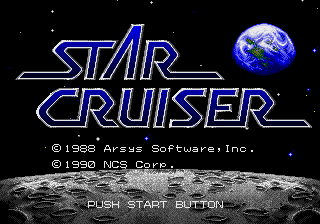 Star Cruiser (スタークルーザー) is a 1990 adventure game for the Sega Mega Drive by Arsys Software, published by NCS. It is a port of Star Cruiser, which was previously released on various Japanese home computers, including NEC's PC-88 and PC-98 in 1988 and the X68000 in 1989. It is a mixture of the action RPG and first-person shooter genres, with the graphics presented in real-time 3D polygon graphics. Upon its original 1988 release, Star Cruiser was an ambitious and innovative game years ahead of its time. The game's innovations included fully 3D polygon graphics (including nearly all objects, enemies, and backgrounds, with the exception of distant horizons that were pre-rendered), true first-person shooter gameplay (anticipating the likes of Wolfenstein 3D and Doom), gameplay mechanics such as strafing, fusion of the first-person shooter and RPG genres (anticipating the likes of System Shock and Deus Ex), real-time 3D first-person movement (unlike earlier first-person games which were pre-computed), 3D open-world exploration across a large game universe (spanning several star systems), 3D space flight simulator segments for exploring outer space with six degrees of movement (and fighting enemy spacecraft), a crosshair to target enemies (both on ground and in space), and a portable computer built into the player character's power suit that has various uses (such as displaying an automap and radar). The game had a large open-world game universe, allowing the player to explore over 30 planets across four star systems, making it the earliest example of a fully 3D polygon open-world game. The game also emphasized storytelling, with an epic sci-fi space opera storyline set in the 27th century, plot twists, character dialogues with NPCs (who have their own background stories), anime style dialogue portraits for characters, visual novel style first-preson cutscenes, animated cutscenes rendered using the game's 3D engine, and a chiptune soundtrack composed by Toshiya Yamanaka using FM synthesis (later released as a seperate original soundtrack CD). Star Cruiser runs on a 3D polygon engine previously used by the 1986 Arsys Software role-playing shooter Wibarm. While Wibarm only used the 3D engine for exploring indoor environments and presented it in a third-person view, Star Cruiser used the 3D polygon engine for the entire game and presented the view entirely in a first-person view. No version has been officially released outside Japan. An English version, retitled Star Quest, was set to be released in North America by Namco in 1994 (being previewed at Winter CES 1993 and Summer CES 1993), but was cancelled for unknown reasons (presumably due of dated 3D graphics). An English translaton beta patch was released at ROMhacking in September 2016, followed by a complete translation patch in November 2016. A sequel, Star Cruiser II, was released for Japanese home computers in 1992. Main article: Star Cruiser/Magazine articles. NEC Retro has more information related to Star Cruiser.